Step into your 1999-2006 Chevy Silverado and GMC Sierra with the AMP Research 75113-01A PowerStep. The AMP Research PowerStep is a retractable electric-powered running board that instantly extends when you open the door. Once the door is closed, it then hides itself safely out of sight for improved ground clearance, aerodynamics, and appearance. Invented, engineered, and built in America, the AMP Research PowerStep has been tested and proven to perform. The heavy-duty OEM quality electric motor provides decades of reliable, maintenance free operation and the stainless steel hinge points and bearings ensure flawless performance. 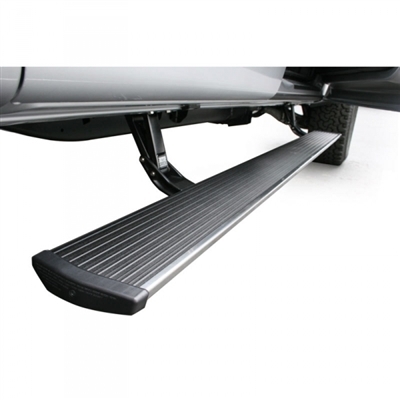 These lightweight, yet rock-solid running boards feature rugged die-cast linkage components that are made in the USA of aircraft-quality aluminum and are black-anodized and PTFE coated for maximum corrosion protection in the snow, ice, dust, mud, and dirt. These extruded aluminum steps feature full-length internal ribs for rock-solid stiffness, and a high-texture powdercoat finish for maximum grip and durability. With a 600lb load capacity per side and maintenance free, self-lubricating bushings, the PowerStep is built to last and gives you the ultimate in styling and function. Its handsome design, all-weather performance and legendary reliability set the industry standard, and AMP Research backs the PowerStep with an industry leading 5-year/60,000 mile warranty. Application Notes: Fits all cabs Trimming required on regular and extended cabs 2500/3500 models with factory air ride suspension requires air tank relocation kit Not compatible with offset collision bracket on the Rebel, Sport, and Express models.